There was a time when we used to prepare just two varieties of chutney's at my home. One was coconut chutney and the other was red chutney. After my marriage, when I myself had to cook for the family who loves to have chutney in almost all the breakfast items, I kept on experimenting with chutney's. There are different varieties of chutney's in my space already. Do check them out. 1. Heat 1 or 2 tsp of oil in a pan. Add Chana dal to it and roast till light brown and crisp. 2. Add jeera and saute it for few secs. 3. Drop in some red chillies and just toss it. Take this out in a mixer jar and allow it to cool. 4. Meanwhile, in the same pan add onions and fry till its translucent. 5. Add chopped tomatoes to it and cook till they turn soft. Switch off the flame. 6. When all the above sauted ingredients are cooled, blend it in a mixer to a smooth paste. Add salt to taste and transfer the mixture to a serving bowl. 7. Prepare the seasoning mentioned above and mix it with the chutney. 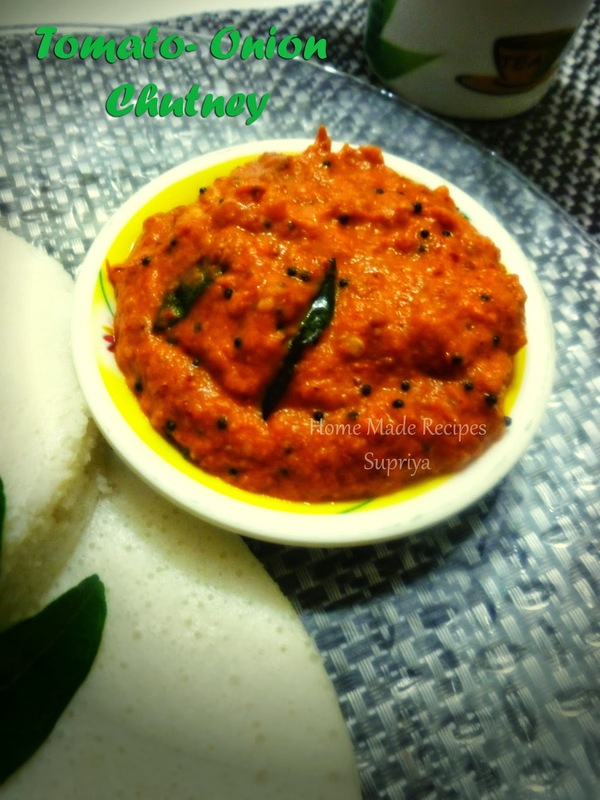 Delicious Onion- Tomato chutney is ready to be served with hot idli's or dosa's. Try out more Chutney recipes here.